Manntech has a long history with over 60 years of experience in providing facade access solutions and developing new innovative technologies for a constantly changing environment. The company was founded in 1953 by the Mannesmann-group. Manntech (Mannesmann Technology) emerged as an independent company from Mannesmann in 1999 and was acquired by Alimak in 2017. Manntech continues a strong tradition of product development and supply of permanent facade access systems to the world market. The company has over 200 employees at six global locations (Germany, Netherlands, France, USA, Australia and Hong Kong) as well as numerous distributors worldwide. Our modern factories, located in Mammendorf Germany and Moerdijk, Netherlands, employ highly skilled engineers to design and manufacture the highest quality and most technically advanced systems available, covering the entire range of facade maintenance equipment. The development of specialized Building Maintenance Units for buildings with highly sophisticated architecture is one of our design department’s areas of expertise. 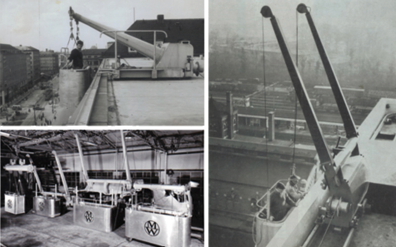 Manntech has manufactured over 8,000 Building Maintenance Units since our first installation in 1953, popularly known as the “Horse on the Roof”. You will frequently find our Building Maintenance Systems still in operation after 40 years of service.